Mr. Trump’s opposition to TPP is consistent with his long criticism of trade practices that negatively impact the American worker and manufacturing sector. 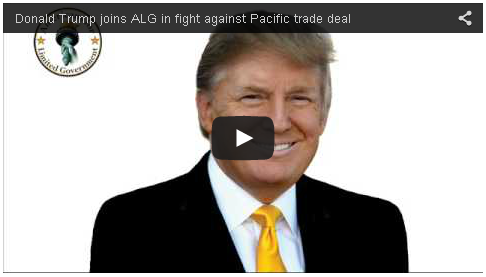 He has been a consistent and vocal critic of TPP and TPA tweeting his opposition for the last year. Mr. Trump’s opposition to TPP is based on his extensive knowledge of currency manipulation and trade agreements that he has accumulated through The Trump Organization’s international dealings. He also criticized leaders for continuing to allow such antics, stating his disapproval of the TPA fast track legislation, which Mr. Trump says is designed to allow the president to enter such an agreement without the support of a supermajority in the Senate. Americans for Limited Government has led the charge against fast track over the past four months being featured and quoted on FoxNews.com, The Hill, the Washington Post, the New York Times, and USA Today among many other outlets.